MIAMI SEAQUARIUM APPLIES TO CAPTURE KEIKO!! IF YOU TRULY LOVE KEIKO AND HATE THE CAPTIVE INDUSTRY SPEAK OUT NOW!! THIS IS NO JOKE. MIAMI SEAQUARIUM HAS APPLIED TO THE NATIONAL MARINE FISHERIES SERVICE TO CAPTURE, IMPORT KEIKO , FOR PUBLIC DISPLAY! IF CFN REALLY MEANS CETACEAN FREEDOM NETWORK ALL ON THIS LIST NEED TO JUMP INTO ACTION!!! THE APPLICATION WILL NOT REACH FED REGISTER FOR A TIME, BUT WE NEED TO INSIST TO NMFS TO REJECT THE APPLICATION AND RETURN IT TO SEAQUARIUM. WE NEED TO DEMAND FROM ARTHUR HERTZ HE IS MAKING A BIG MISTAKE HERE AND MUST WITHDRAW THE APPLICATION. I HAVE CALLED TWO MEDIA OUTLETS. SPREAD THIS FAR AND WIDE! NORWAY STILL HAS STATED THAT KEIKO IS SAFE THERE, BUT WE NEED TO HIT HARD HERE IN THE U.S. AND ALSO ASK NORWAY TO NOT ALLOW ANY CAPTURE OR INTERFERENCE WITH KEIKO'S PROGRESS. Phone: 301-713-2289 , fax 301-713-0376. Fax: +47 22 24 95 85. LET'S STOP THIS INSANE IDEA BEFORE IT GETS TO THE FED . REGISTER! WITH ENOUGH PRESSURE FROM WORLDWIDE WE SHOULD BE ABLE TO KEEP KEIKO FREE!! DO IT FOR KEIKO , THE OTHER POOR CAPTIVES, AND OURSELVES. We're writing to ask for your help in dealing with an URGENT problem Keiko has run into� Norway. As you may know, Keiko has been swimming free in the North Atlantic for more than a month now... during this time he traveled the ocean between Iceland and Norway, finally arriving near the coastal community of Kristiansund on August 28th. The next day. photos were taken of him that showed Keiko to be in perfect condition, proving beyond doubt that he is able to feed and fend for himself. This was GREAT news! Two days later Keiko moved on, heading north along the coast of Norway. He soon encountered a small boat with a family on board that was out for a day's fishing - after making contact with the children and accepting fish from them, Keiko followed the boat into a small fjord called Skaalvikfjord and the port town of Halsa. His presence caused a great stir because he was quickly recognised as the famous star of the film Free Willy. People flocked to the shore to see him, boats crowded around, kids jumped into the water, media arrived. Only the overnight arrival of Keiko project staff, who had been tracking Keiko via his satellite & radio tags, prevented the situation from becoming a circus. They quickly sought & gained the cooperation of much of the community. Nevertheless, when the story got out, some very scary & serious developments took place. Most alarming was the call by one apparently respected whale researcher to kill Keiko �for his own good�. Judging by the reaction within and outside Norway, this sentiment is not likely to determine the outcome of Keiko�s foray into Norway. However, Norway is a country determined to continue killing whales in the face of world opinion, and because of that Keiko may well be in great danger. What is needed NOW is an appeal from people around the world to the government of Norway to act quickly to protect Keiko. This, then, is an appeal to YOU to help Keiko, NOW. PLEASE, before you do anything else today, go to http://www.embassyworld.com/embassy/norway1.htm; and locate a Norwegian embassy or consulate in your country. 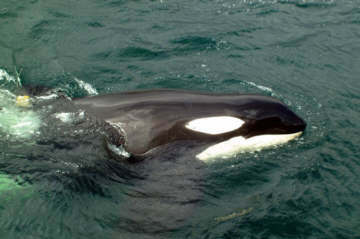 Phone or fax your appeal to Norway to protect Keiko. Remember that phoning or faxing gets more attention than an email, so please take the time. You can also send a message directly to the government of Norway. The Ministry of Environment has a message board at http://odin.dep.no/md/global/kontakt/index-b-n-a.jsp. The Ministry of Fisheries can be reached via email postmottak@fid.dep.no or phone +47 22 24 90 90 or fax +47 22 24 95 85. Please pass this message on as far and wide as you can. If enough of us who care about Keiko, and our children, and their friends, and their friends let Norway know how we feel, Keiko will be safe to continue his journey. Otherwise, Keiko�s incredible journey into freedom may end before it has barely begun. **PAM'S NOTE**If you haven't already, please visit the KEIKO FORUM for all the latest news on our beloved Keiko brought to you by the Orca Network. !